PBP – Arabella has a snooze or 3. Well, I was going to blame the pain and grief of PBP all on Margaret (Phillpotts), but I had such a good time that at the end sent her a big thank you. The story winds back a few months to when I was putting together an Arrow team (a Ladies’ team, for Ladies), Margaret pointed me at Mark Brooking; whom she thought might know someone’s email. Mark didn’t, though he did offer to ride in drag. I declined, so he suggested a go on the longbarrow (tandem trike) instead at some unspecified future time. On the basis of ‘I’ll try anything once’ I accepted. We survived Herman’s Green and (not yet) Yellow fields at the beginning of April and decided, after a bit of persuading on Mark’s part, that this joint and so far only 300km would be a good basis on which to enter PBP. Several slips and another 300km ridden, there we were at Dover: Mark (driving), Lindsay (West Suffolk Wheelers), Peter and Ray (Willesden, like Mark) and me plus the odd trike, bike and such. “We are finely honed athletes at the peak of our performance” said Lindsay. My children ran off giggling – we all met as I left them at my parents, near Dover. Lindsay and I then snoozed away until Paris. About 5pm on Sunday 21st August we rolled up for our 5:30 pm start. Mistake: even one hour beforehand there were masses of 6:00pm starters already queueing up. Cue my loud voice “make way for the special bike” and intervention by an official. We made it through the crowds and hid at the back of the ‘special machines’ ie trikes, recumbents and other strange things in a handy bit of shadow. 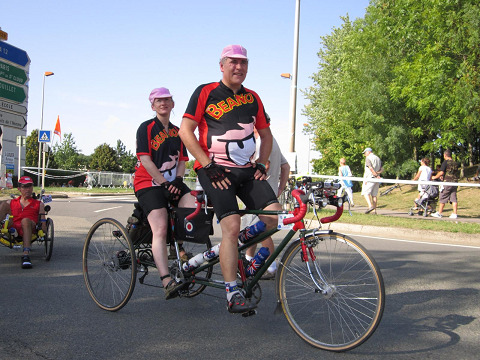 Team uniform was Dennis the Menace tops and pink hats. More photos. Eventually we were off. Part 1: charging out of Paris in company of other strange bikes (including Drew Buck’s 1905 something-or-other and Bill Schwarz’ handcycle), getting priority at all the junctions, with marshalls waving us through. Eventually things settled down to a steady pace and we started bobbing around similarly paced folks as the peloton got longer and slimmer. 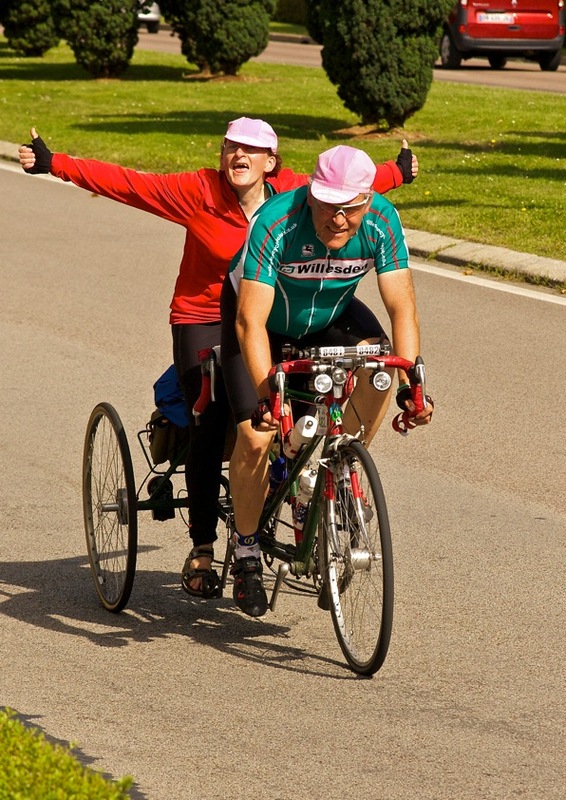 We chatted a while with Bill, the handcyclist – very strong upper body, of course. Seemed to be getting along fine on his front wheel does everything trike. Not much later on, the fast 6:00pm and later riders started whizzing past in batches of whoever was left by then. ‘Slow down’, call I. ‘It’s not a race! You’ve got plenty of time!’ but to no avail. Then the first vedette returnee, burnt out and abandoning a mere tens of km into the ride. [Vedettes leave at 4:00pm and must finish in 80 hours]. ‘You’re going the wrong way!’ elicited no reply. They’re obviously taking it all far too seriously. By and by dusk falls and we stop (Chateauneuf en Thymeras) for a drink and a coffee. Mark claims coffee does nothing for him and has coke instead. I find that this time he is correct and I miss the coffee effect for the duration of the ride (mistake, as we shall see). It’s still fairly warm, though at some point I may have added a layer. Certainly it’s true I put on my stunning (Sudbury CC orange) high-viz jacket, as mandated by French law and stringently checked on the ride. Everyone else has done the same so there’re a variety of white stripes up ahead whenever I crane my neck for a look over Mark’s shoulder. (Disadvantage of stoking a tandem: no view up ahead. On the other hand no thinking is required either ….). Rear lights with a variety of brightness but no flashing ones (banned – hurrah). The other ‘regulation’ we noticed was the requirement for bicyclists to put a foot down at junctions (not necessary on a trike of course). There were some riders towards the end who got grumpy & insisted on putting a foot down at every stop line … whilst everyone else just sailed past in a too-tired-to-care-and-it’s-clear sort of way. On into the night – Mamers, La Hutte – ring bells but can’t say why. The field thins out so I start to sing. Not sure how much Mark actually hears but he claims it’s OK. The idea is that the singing will spur him (and indirectly me) to pedal harder. Judging by our just-within-the-limit total time this theory may not have been entirely correct – but who can say what would have happened without my dulcet squawks. Oh well. I air much of the motley assortment of songs-of-which-I’ve-been-reminding-myself, though I save ‘Oh for the wings of a dove’ (learnt age 9) for a dire emergency. Fortunately for Mark, no emergencies dire enough arise. I try to sing as we go uphill and subside into a bout of coughing. Problem: I am carp at hills, Mark is not much better (so he politely said), so together with a nice lightweight longbarrow (weight: ½ Arabella) each upward ascent consists of much puffing and panting from the two of us plus the accompaniment of the sound of anyone else whizzing by. First control at Villaines, 221km and about 12 hours after we’ve started. It’s about this point that everything starts to collapse into a blurrrr, and remains so for the next few days. Isolated incidents jump out, in no particular order. We sleep, we awake, we pedal, we eat and so it goes. PBP is hard; not because of the hills – it’s not that hilly, not because of the distance – what’s 1200km between friends – only 2 600s back to back with 10 hours sleep in between; but because you start off in the evening and have to keep going for loads of hours (at our speed) to build up a big enough sleep buffer. Incident: Jo (with whom I stayed for LEL) rolls along side and we catch up on news. He lets on that Mrs Jo. will go away as soon as he is safely back. Given the marathon sleeping we did at his after LEL this is very wise of her. Mark and I (and the others), with assorted children, will do most of our catching up with sleep on the way back: Mark’s plan – take ages to get back and so avoid driving too much when too tired, very sensible. Incident: Matt (M) (of Suffolk Sideways on radio Suffolk) rolls alongside for another catch up. Matt is moving out of Suffolk soon, though only as far as north Essex. Incidents: every now and then on the way out we cross the other Matt (C)- he was out of time on the last PBP, but all he needs to do this time is stay ahead of us, which he does, fairly convincingly. But Matt has a reputation for faffing and so on the way back (somewhere, maybe it’s Fougeres) we see a Matt-alike busy faffing I get ready to accost him for a good laugh. Luckily I realise before it’s too late it’s some other bloke. Incidents: A lot of passing riders pause, ask if it’s OK to take a photo, take one and zoom on. Others just take a photo anyway. I evolve a theory that all the shiny bikes which seemed to overtake us in batches were in fact the same group which would disappear round a corner ahead, have a rest and pop out again once we’d passed. Incidents: one feature of PBP is the roadside stops set up by locals: water, coffee and other delights on offer. We stopt at one fairly early on, in the heat of Sunday evening for some water. I was asked about my ‘cycling sandals’ and had to confess I’d purchased them at Carrefour (a supermarket chain) 8 years previously. “Conversations are good. You seek them out in the end. You eye up your prey … will they talk? I found conversations harder to come by than on LEL. Surprising really since there are so many more riders on PBP. I put it down to not seeing the same people as often as on LEL where you get to know the riders around you. You just say a hello, see if they bite. Then ‘ca va?’, ‘ok?’, ‘alles goed?’. I usually like a quick chat, get to the point. But not on PBP, I didn’t mind if they got to the point via Biarritz or Brazil. But I was always surprised when riders did not even return a hello. We stop for a spot of soup while with Els, very nice it is too. Grandma is presiding over the randonneurs and the grownup children are doing the work. Incident: we caught an Alaskan Randonneur by the same method – having worked out, as had Els, that the best way of making the road go by at night was to talk. He explained that there were 4 SR (200, 300, 400, 600km ride series) in Alaska that year. 3 of them were on PBP. The fourth had decided to organise a local ‘something long’, the Great Wild Ride 1200 – which rather baffled the other three since they were already committed to being elsewhere (ie in France). Incident: I tried persuading people that we were a couple of oldies and needed some TLC. No result until some time the next day when A Brazilian chap rolled alongside, pushed us up the hill and then rolled off into the distance with just a handshake. But we kept seeing him at controls thereafter. I’m not sure if this was the same chap I talked to briefly in Spanish or not, having run through other linguistic options first. This reminds me. I got to exercise each one of my dozen (all remembered this time) word of Russian. And there the conversation ended. No German required, strangely enough, but I used a lot of French, naturally. Incident: We reach Loudeac outbound behind the lightning and storm. Flashing lights of the wind turbines, some red, some white. I never did work out why, too hard (poor ickle tired me). Lucky us we don’t get rained on – as we are sleeping a la belle etoile. I go off to find the showers and am told to use the pedestrian entrance (no bike), which is far from obvious. I can’t decide whether to burst into floods or start ranting, and so do neither. The showers are empty and I take my time, returning to find Mark having a quiet shave and eating mightily. I start eating too and find he has kindly left me (i) the sleeping bag with a working zip and (ii) the sleeping mat. This is far too kind as I can turn off my brain on the back – but I ain’t going to wake him to tell him so instead I enjoy. It turns out the tree we are under is a fig tree but no figs. It’s still dark when we leave, and definitely chilly. It’s still dark when we get back again, about 24 hours later after an outing to Brest. This time there is another lady in the shower, daughter to the bird in the trousers who turns up just as I am leaving. I’m more efficient this time and am done in the time daughter takes to faff having just finished as I arrived. (smug). Mark has left me the mat again, on the excuse that I am lacking in (a) padding and (b) insulation. Suppose he’s right. It’s cold when we leave, again. Incident: At the not so secret control at St Nick do P, for some reason we have a sit down on a pair of lovely mattresses, I forget why, but the must-go-on bit of my brain was insisting that we shouldn’t succumb to the lovely softness and so I chivvy Mark on ere long. Mistake as we then need a not-nearly-as-comfy bit of grass verge for some much lower quality sleep. Incident: a snooze or few. Item: one bus shelter with bench and dry floor. Mark suggests I have the bench. It’s not much wider than the aforementioned plank, but much warmer. Eventually I hear cleats on concrete, we haz been photoed (twice, it turns out). We continue with photographer #2, Paul Stewart, for a while but he drops us ere long. Incident: someone put some hills in Brittany. Not fair! (Fortunately for me they have shrunk in the past few billions of years though). We crawl up them and into the mist, then on and on upwards with more mist. Fantastic view from the highest point of the ride I don’t think (but it’s OK, the fog has gone by our return so we get the views then). I think it’s parc naturel regional d’Armorique (as in Asterix). We didn’t, however, spot any wild boar – though some folks did. Incident: at a certain point in the ride there are a couple of folks in identical rain coats, the lady of whom also has trousers – you know, the ones that are boil in the bag. Mark dubs her “the bird with the trousers”. Every now and then there she is again. The trousers come off for the second half of the ride. Having failed to note a frame number I’ve no idea if she made it or not. Incident: Brest, sandwich hall: there lieth Paul slumbering shallowly, so a return snap is taken. Paul awakes, shivering and frozen, so I wrap him in a handy space blanket for a warm up before we leave, taking said space blanket with us to use as a tarp on the last night near la Hutte (again, we must be on the way back now.) Although empty when we settle down the area is shortly alive with other people snoozing, chatting and whatnot. Very strange. We move on. Incident: I ask Mark how fast we’re going. ‘Weeelll, we did 40mph at one point before the speedo gadget died’. That kept me happy. It was probably one of the times that I tucked in with eyes shut and held on tight – until I remembered I’d need open eyes to see when to lean at the corners (on a trike the rider(s) lean at corners and the trike doesn’t – otherwise it tips over). With open eyes I can see how far the front tyre gets squidged as it’s turned – lots of squelching sideways of tyre etc. Back wheels, though, last for ages – no stress, hardly. Along the way by dint of many questions I become reasonably versed in the longbarrow, so get my 5 mins of fame on our return to Villaines as I’m interviewed. ‘Gears at the back – it was built as a racing trike so the captain wants to keep his hands on the steering, you see’ [in French]. Mark drags me away as we aren’t over free on time (a few mins behind at every control from Loudeac, outwards, onwards). Incident: Secret control at Quedillac. Lindsay is there. I borrow her shoulder for another snooze. The bird with no trousers is there too, and I advise her to grab a gym mat and have a proper sleep. Shame I didn’t follow my own advice. It seems Lindsay had a handily placed friend with a handily placed fluffy duvet, shower and all manner of nice things in Corlay. Incident: Climbing the Roc Trevezel another cyclist draws alongside on a sit up and beg complete with wicker basket, flowers and flowing skirts (OK, divided skirt, but still flowing). I was disappointed by the rear derailleur but as I’ve only done a 600 on a SUAB and am on a geared longbarrow then who am I to talk? We chinwag a while and on she goes. Apparently there is a someone with a dog in a front carrier too, though I don’t think it’s the same chap as did the Dun Run. Incident: La Tanniere – we stopt on the way out so Mark could admire the postcard he sent last year. Then again on the way back and had some pancake and … a snooze … 20 minutes in a quiet room indoors on a mattress and with a nice fluffy blanket. Best sleep of the whole ride. So when you go there next time look out for the postcard of Grandma Giles & Co I sent upon my return. Incident: somewhere in the dark I start to get an attack of the dozies. That’s OK though as I don’t need to keep my eyes open, all I need to do is hold on and pedal. So I try for a bit of shut eye, only to be rudely dragged back to reality as my hands loose grip and then my brain kicks in and grabs at the handlebars once more. So that didn’t work. I start to sing instead. The singing is so bad (or good) that it doesn’t even keep Mark awake. “Beware the drooping left shoulder”. Somewhere between Uzel & Grace Uzel, a dark and featureless section of road at this time of night, there it was, right in front of me – drooping shoulder. “Oi, Mark, are you awake?” “Mumble” “Go a bit more left, we’re too close to the edge of the road”. And On we go, me craning my neck to the right, Mark drooping to the left, occasional shrieks of “Oi, wakey wakey!” and trying to talk Mark into doing this and that. ‘More to the left’. Nrghhhh! ‘Headed for Bus shelter?’ ‘Not yet – Loudeac first’ Droopy shoulder raised briefly. Arrive in Treve – spy a sign with distance to Loudeac – pace picks up at prospect of camp Willesden (fluffy sleeping bags etc.). Situation wasn’t improved by a gradual 300 foot climb, however this steering-by-stoker (sort of) works and we reach Loudeac unscathed. Incident: The last night on the road we spent at Mortagne au Perche (as in Percheron horses, akin to Suffolk Punches). We didn’t quite sleep in the open this time, being in the spectator stands of a something. I get the mat again. 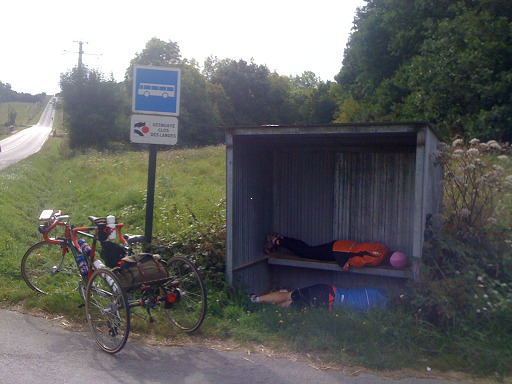 Incident: Chap rolls alongside on recumbent and we discuss the joys of riding tandem, he says his tandem the stoker goes on the front and can see what’s going on (at least I think that’s what he said but we were into day 4 by then …). ‘Oh, such trust,’ he muses at our arrangement, ‘what love!’ … Mark and I stifle giggles at that point, well I do, Mark has to wait for the translation. Finally: Dreux. We are at the edge of time. The run in to Dreux is long and dreary, featureless, and we cursed our way across the plain. I ran out of swear words very quickly so recycled them freely every second word “Stupid * plain, stupid * road, * * etc.” Not very expressive. At Dreux we turn up the alertness. Quick – control – quick – queuebarge for the set breky – quick – don’t wave at the Brazilian as we stuff our faces just in case it delays us – quick – whizz out again and off for the last leg (we are on our …). Time to turn up the speed. No more gentle freewheel every once in a while, just tank along, quick. Up the hill, quick, keep going. Pass all these other folks – keep it up. Quick, we’re doing OK, quick. Mark says there’s only one more hill. This was true, apart from the other more hills he’d forgotten. Quick – up, quick – down. Nearer and nearer. Cheering crowds start to line the streets, I start to recognise we are nearing the end, quick – no, stop: traffic lights. a stop-go-stop-go finish to things. We made it with 14 minutes to spare. And afterwards: there is a bun fight at ‘the end’ ie once the last 84 hour riders have officially finished. It’s mayhem and I’m sure most of the people there were helpers. I catch up with some fellow AUKs and also see: Remas who finished in 60 hours (stunning, I think), Simon S aka fast ‘person’ (only I wasn’t so polite)), Lindsay (nice pillow), Matt C & so forth..
We drive back at a leisurely pace; stopping in Chantilly for lunch, a chocolate shop and sightseeing (the stables are distinctly larger than chateau Arabella). “Oh sacré .. pink, not those hats again!” says Ray, as we once again don the pink hats. But it makes us easy to spot as we somnambulate around the town. Then Arras (twin town: Ipswich), another stop in St Omer as we are otherwise a bit early for the ferry. Then across the channel and back to reality “Why did you abandon us, mummy?”. “Nonsense, it was good for you”. Top food: chocolate cake at Sizun on the way back. Very squelchy and came with coffee. A bakery at somewhere else where we had pains au chocolat, the soup we had with Els, the set brekky in Dreux. Top (?) town names: Meneac, Mouron and Dinge, St Meen. Tim Wainwright as assembled a fantastic collection of Paris-Brest photos here. They can be purchase from Tim by contacting him at twain@blueyonder.co.uk. The pace picked up in the last section as we were in a hurry. Big drops in average speed meant longer sleeps. Note the time spent at a control is rolled into the time spent getting to the following control. So pretty meaningless, all in all! One Response to PBP – Arabella has a snooze or 3.